Colorado Springs’ favorite Irish pub is gearing up for its biggest weekend of the year, with its most legendary dish – the corned beef – supplied by Ranch Foods Direct. 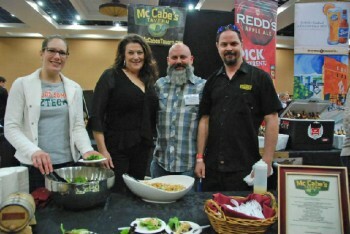 Greg Howard, shown above surrounded by his crew from McCabe’s Tavern at the recent Colorado Restaurant Association hospitality expo at the Broadmoor, is excited about gradually adding more Callicrate Beef items to his menu. “I am a huge Callicrate cheerleader,” he said. For years, Greg remained skeptical about putting Callicrate burgers on his menu, mostly because he doubted customers would be willing to pay more for a better burger. But after he finally gave it a shot, he soon went from selling 50 burgers a week to 200 and his customers were thrilled. He now has several creative Callicrate burger versions on the menu, including a black and bleu, BBQ bacon and the Philly.